"Cherokee Hair Tampons," the South Park episode featuring Cheech and Chong, has won Comedy Central's South Park e*LECTIONS. It airs this Wednesday, August 23rd at 10PM on Comeday Central. Story tomorrow, Friday, February 22nd at 8PM EST. 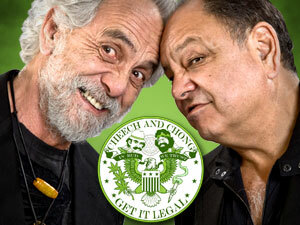 The two hour special will detail the rise-and-fall of Cheech and Chong, as well as the reasons why Cheech left the duo. Don't miss it! News courtesy of 420 Times...Although H.R. 2987 (The Meth Bill) passed the House Judiciary Committee last week and was sent to the House floor to be scheduled for a vote, there is some good news to report. For starters, the Committee removed all of the anti-free speech provisions. Gone are the provisions making it a federal crime to teach or distribute information on the manufacture of a controlled substance. Gone are the provisions allowing federal agencies to order internet service providers to take down web sites that the feds believe to be illegal. Also gone are the provisions banning the advertising of drug paraphernalia. These are huge victories and come on the heels of last week's removal of the anti-4th Amendment 'sneak and peak' provisions.